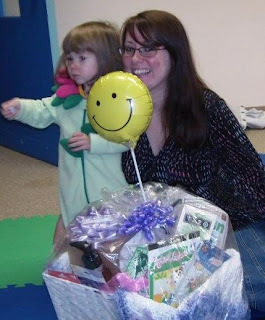 While we didn't have a shower for V, our Kindermusik family did shower us with gifts of comfort and love our whole family both before she arrived with a gift basket and after with a brunch to celebrate her life. We also were surrounded with love in the form of gifts, meals, and well wishes from all over. Thank you for these gifts we will never forget. No picture for this one, but I've always been amazed that Violet was with us for exactly 2.5 days, which is the average age for a baby with Trisomy 13. From Wednesday, November 2nd at 9:04 am to Friday, November 4th at 7:30 pm.